This is my first post in the Geeks' Corner, and my second post on this website. Hopefully some of you find it interesting! What is a theremin? 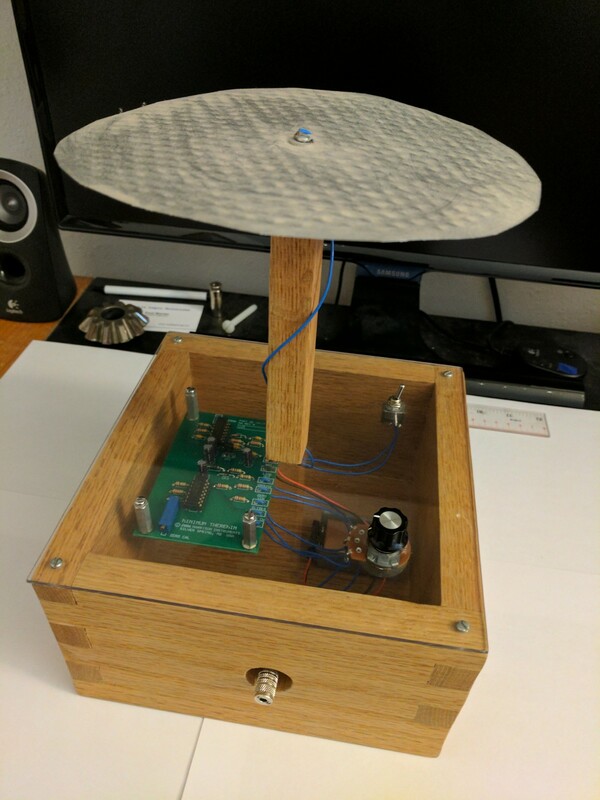 Well here, I'll save you a click and quote the Wiki page: "The theremin is an early electronic musical instrument controlled without physical contact by the thereminist (performer)." Well that sounds cool as heck doesn't it? An instrument that can be played without touching it! Those were my thoughts exactly. 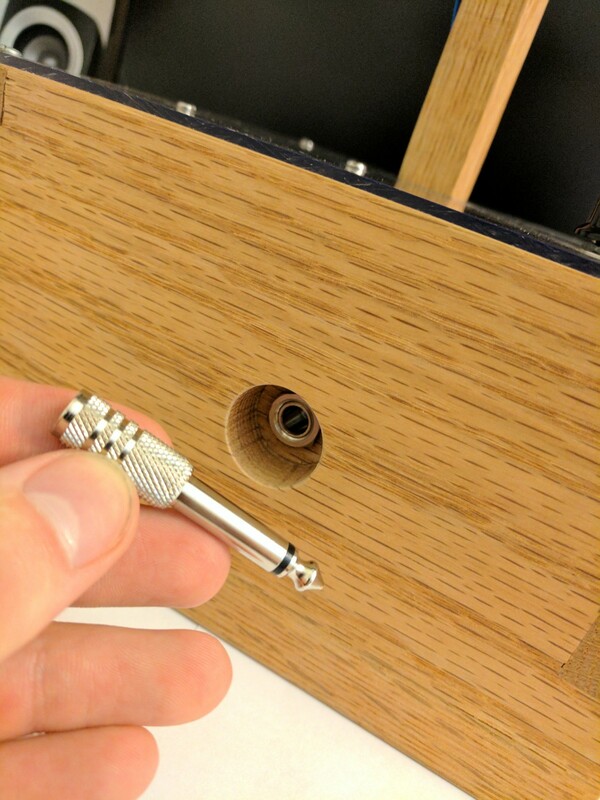 So my interest was peaked, but there was no way I was gonna spend $500+ on a musical instrument that would basically just be a novelty item on my workbench. Enter the deep dark depths of my DIY madness. 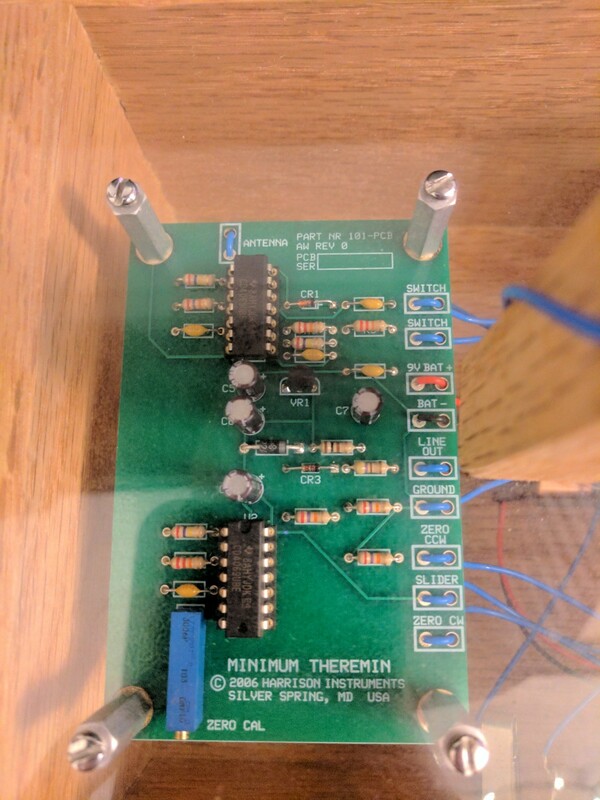 I began learning about the mechanism that allows theremins to operate. To explain it as simply as possible, the antenna and your hand create a capacitor (kinda like a battery that can store a charge). As you move your hand closer to the antenna, the capacitance increases. The circuit uses this capacitance to control the frequency of the audio output. As the capacitance increases (hand moves closer) the frequency also increases (higher pitch sound output). Ok that's enough science for one day. I realized that tinkering with the circuitry may be a waste of time, since other people have done it many times before and tuned their devices to work reasonably well and have a reasonably linear span of frequencies vs distance. (Think inverse square law, as you move closer to the antenna, the *rate* at which the capacitance grows, also grows. [mouse sensitivity over 9000!]) 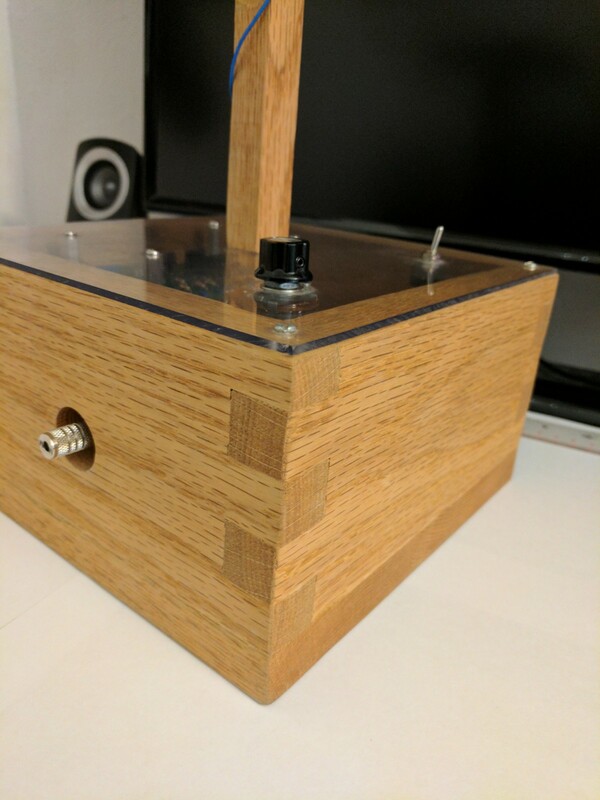 So instead of delving into the art of tuning theremins, I decided to go for a PCB kit that some smart guy somewhere designed and sells online. (link) I got the basic PCB kit. You may have noticed that I used the bottom of a disposable pie tin to create the antenna. This works decently well and creates a reasonably linear and spread out range of frequencies vs distance. I use disposable cooking tins all the time for various projects, I don't think I've ever used one for cooking though! In the photo above, you may notice the two controls that I've mounted in the acrylic plate. 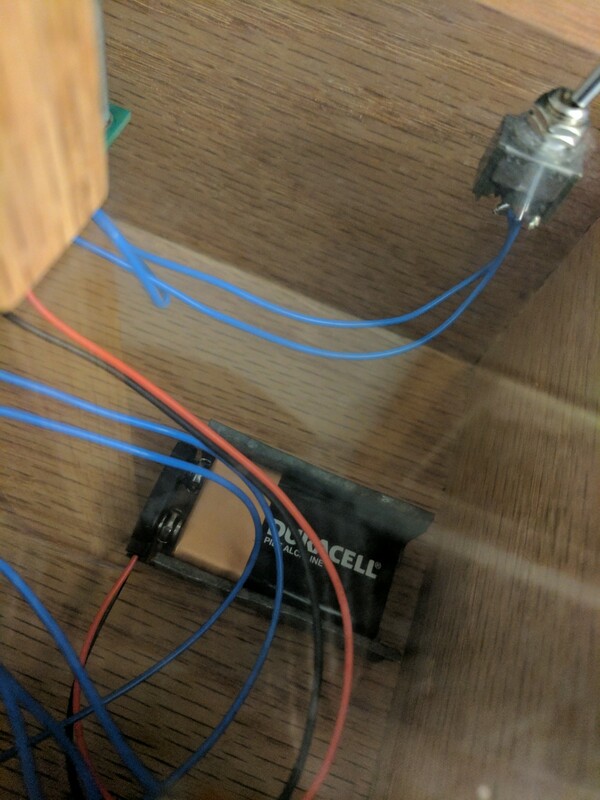 One is a simple on/off switch, and the other is a potentiometer to control the pitch "zero" spot of the instrument. Basically I hold my hand about 2 feet from the antenna and turn the knob until it stops making noise. Then once I get closer than 2 feet it will start at the lowest frequency right there. I've noticed that this setting changes depending on whether I am plugged into a grounded guitar amplifier, ear buds, or other speaker devices. Interesting. I'll spare you all from listening to the "music" that I make with this thing. But to summarize the experience, I would say that playing this instrument is just like whistling with your mouth, but slightly less intuitive. There isn't really a technique, at least not one that I know, the method is self explanatory. Move you hand closer for a higher pitch, farther away for a lower pitch. I am able to play scales and simple tunes like Green Sleeves, but mainly it's just fun to mess around with and make alien spaceship noises. I have not read through it all yet. But just awesome. I love this instrument as well as laser harp (also somewhere here as well). What about posting some music from it? I repped you recently, therefore I cannot yet. But it deserves rep+ IMO. Laser harps are super cool too. Any instrument that can be played without actually touching it just has a major intrinsic cool factor. May make a video sometime of some theremin "noise"
Do as you like - play with it, test it, experimet with it... Take your time, no need to do it immediately.